By the time Stanford University formalized its Office of Sustainability and Business Services (SSBS) 10 years ago, the university already had a track record of undertaking major initiatives to reduce its environmental impact and to conserve or preserve resources. For decades, the campus had implemented programs related to landfill waste, domestic water use, and drive-alone commuters. Today, SSBS serves as a programmatic hub for those and many other initiatives under the banner of Sustainable Stanford—the university’s holistic, campuswide effort to integrate environmental awareness into campus culture; make sustainable practices a part of everyday life; and incorporate sustainability into all aspects of campus purchases of products, services, and food. The institution in Stanford, Calif., has reduced greenhouse gas by 68 percent and decreased the use of potable water by 45 percent, according to Stanford’s latest annual report. The drive-alone rate stands at 50 percent, while solid waste diversion is at 63 percent. In 2017, Stanford earned a Platinum rating through the Sustainability Tracking, Assessment & Rating System (STARS)—conducted by the Association for the Advancement of Sustainability in Higher Education (AASHE)—in recognition of the university’s sustainability achievements. After several years of research, piloting, and focus groups, Stanford launched people-facing programs under the moniker Cardinal Green, which represents all the programs packaged for regular use by the campus community. During this time, the campus renamed a lot of its programs for consistency, connectivity, and ease of use. Users can access theseprograms through theMy Cardinal Green online platform, which offers a single access point for everyone on campus to engage with sustainability. It provides a holistic, quantifiable approach to encourage the campus com-munity’s participation in water conservation, waste reduction, transportation choices, sus-tainable purchasing, healthy food choices, and many other behaviors. The entry point is an online survey that assesses each person’s current level of sustainability behaviors. The platform then connects users to a personal dashboard, suggests actions for reducing their environmental footprint, and engages them in diverse sustainability programs—allowing users to track their progress throughout the year. Today, the fast-growing program has 3,200 active users. What drives this level of steady and cumulative success in infrastructural and behavioral programs? Taking a data-driven approach in all areas, including behavioral programs, helps the university connect sustainability to the reality of institutional practice, as well as the bottom line. Stanford documents and reports this data in numerous ways, from issuing an annual greenhouse gas inventory, to preparing an annual year in review, to providing access to online dashboards that show real-time utilities consumption for 135 individual buildings and the performance of campus systems. One example of this data-driven approach is a comprehensive plug load study. Given the increased market penetration of electronic products, SSBS thought it prudent to address this growing area of electricity consumption. Staff believed plug loads represented between 20 and 40 percent of the overall campus energy consumption, but they needed more than an estimate to create programs that the campus community could use to decrease plug load. A thorough inventory of every plug that drew power from an electrical outlet—computers, printers, office accessories, audiovisual and lab equipment, and kitchen and laundry appliances—became necessary. During the summer of 2014, SSBS hired 12 student interns and supplied them with an internally developed smartphone application that provided floor plans and online inventory forms. The interns combined this high-tech application with old-fashioned legwork to accomplish their goal. They visited major buildings on campus, room by room, and recorded not only the type of equipment present, but also its particular attributes, such as the type of light bulb used in a desk lamp. Typically, building managers accompanied the interns for a portion of each building’s inventory to provide access to locked rooms, attics, basements, and IT closets. As part of the inventory, the interns also noted environmental health and safety issues—such as caches of dangerous materials, fire hazards, and obstructed egresses—and counted water fixtures and the number of occupants. 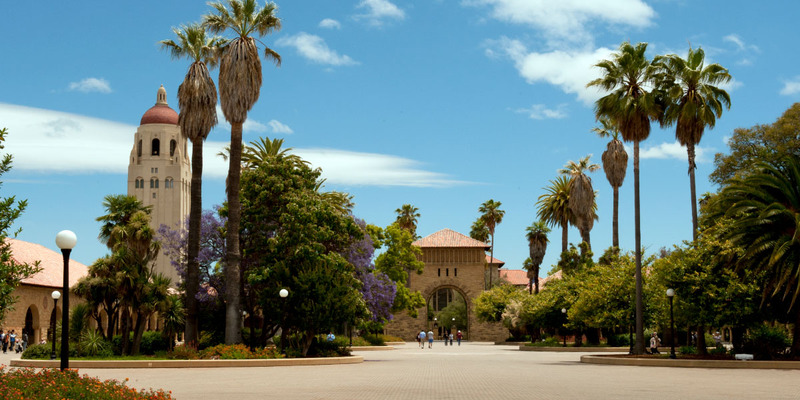 Within five months, the interns had inventoried 60 percent of Stanford’s campus, including 90 offices, 42 labs, 34 classrooms, and 54 other facilities in 220 buildings comprising about 8.9 million square feet of space. In 2015, SSBS undertook a second phase of the inventory to include student housing, which represents another 26 percent of building space. At that time plug loads in Stanford’s two data centers were also included, based on employee reports on the number of servers; those spaces had initially been excluded because of security concerns. Not surprisingly, the results showed that lab buildings are the most energy intensive by far in terms of plug loads. Lab equipment represented nearly 50 percent of the total plug load on campus, followed by computers and monitors at 36 percent. Overall, calculations indicated that plug loads equalled34 percent of the total campus electricity consumption. Under the banner of Sustainable Stanford, the university takes a data-driven approach to enhancing environmental awareness and understanding changing behaviors. The data provided by the plug load inventory helped SSBS refine a number of its existing programs, all of which rely on the extensive data and metrics tracked by the office. Here are examples of programs that benefited from the plug load data. Cardinal Green labs. Through green labs, SSBS shares information on the benefits of upgrading to efficient models of energy-intensive equipment—such as servers, laboratory freezers, and bio-safety cabinets—and reports on sustainability progress, which creates competition among the many labs on campus. Twice a year, a lab equipment share event enables labs to drop off, pick up, or swap lab equipment for free; at each event, we save nearly $150,000 in research dollars through the reuse of materials. Labs can also save money through rebates when they purchase energy-efficient appliances. For example, replacing an old bio-safety cabinet with a direct current model translates into 70 percent energy conservation and makes the lab eligible for a $2,800 rebate. Cardinal Green offices. The university also offers rebates for “smart” power strips and programmable timers that save energy in offices overnight and on weekends. Following the success of the plug load inventory, SSBS conducted several studies and found that the energy and money saved by using these devices fully subsidized their cost, ultimately justifying their implementation in the first place. The plug load inventory also revealed that space heaters were common in Stanford’s offices; now a space heater swap program allows building occupants to retire their space heaters in exchange for a free fleece jacket. Cardinal Green buildings. SSBS works with selected buildings to shut down HVAC systems and custodial services to conserve energy during long weekends and holiday breaks. Each winter, Stanford orchestrates a two-week shutdown of several buildings; this has saved an estimated $4.4 million in utility costs since the initiative began in 2001. The impact of Stanford’s data-driven approach to sustainability programs is evident in its key performance indicators, which the university has tracked since 2000. Visit http://sustainable.stanford.edu to view these metrics in the 2017–18 Sustainability Year in Review. The analytical ethos with which Stanford operates its programming ensures that the university will continue to monitor its progress and evaluate new opportunities for energy conservation on a regular basis. SUBMITTED BY Fahmida A. Bangert, director, sustainability and SEM business services, and Moira Hafer, building sustainability performance manager, Stanford University, Stanford, Calif.